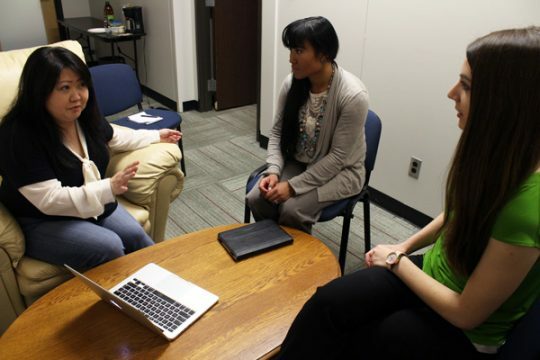 Education faculty Toko Oshio works with her student research assistants. 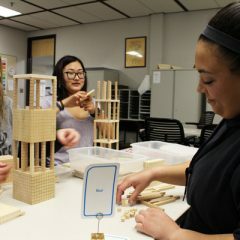 University of Michigan-Flint students Jessica-Maris Wallag and Laura (Nina) Quasarano have discovered the benefits of working closely with faculty to conduct academic research. Both are currently working on a research project with assistant professor Toko Oshio in the Education Department. Maris is pursuing her master of arts in liberal studies in American culture. Laura is pursuing her bachelor of science in elementary education with math and English minors. Q: How did you get involved with doing research as a student at UM-Flint? Maris: I was familiar with research from my undergraduate degrees. I earned a bachelor of science in anthropology from College of Charleston in 2008 and a bachelor of arts in history from Arizona State University in 2016. My program advisor is Jan Furman. She is very encouraging and supportive. I met with her and asked her what I should begin to do if I was serious about pursuing further education after my MA. She suggested that I should pursue a research assistantship because I would gain important skills and real life research experience. Laura (Nina): I was a student in one of Prof. Oshio’s classes during the winter 2016 semester. She mentioned during a class period that she was looking to hire a multilingual student as a research assistant, so I applied. Q. What is your research about, and what do you enjoy about working alongside Prof. Toko Oshio during the process? Maris: We are working to do research about high school students that are part of underprivileged and underrepresented populations. I really enjoy working with Dr. Oshio because she is a very passionate and hardworking researcher. She has already taught me important skills that I can use in my own research for my master’s thesis. She is very helpful and thorough. I never feel lost or overwhelmed in this project because she is always there to support me. Laura (Nina): Prof. Oshio’s research is looking at the development of underserved adolescents. I enjoy the work because I know the research I’m involved with could potentially inspire change in regulations that hinder the rights and quality of life of the subjects we are working with, which is very rewarding for me. I also believe that working with human subjects is incredibly fascinating, which makes the work very enjoyable on a day-to-day basis. Q. What kinds of practical skills are you developing from this experience? Maris: I am learning how to do literature reviews and sorting the data I collect. Laura (Nina): I have become much more familiar with the research world and how it works, which is important to me because I intend to pursue my own research in the future. I have had the opportunity to practice my foreign language skills as well. 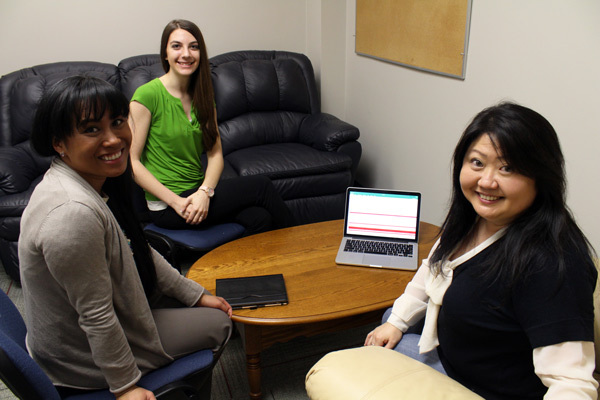 Graduate student Jessica-Maris Wallag, undergraduate student Laura (Nina) Quasarano, and Assistant Prof. Toko Oshio, Ph.D. discuss their research data. Q. How is your research work with the Education Department helping you to sharpen your career goals? Maris: I hope to continue on to pursue a Ph.D., and this research is making it clear to me that this is what I really want to do. Getting some of this experience makes my master’s thesis seem less intimidating. I know I want to work in higher education and I know that I want to teach. Laura (Nina): This research project has inspired me to go forward with a career goal that initially I was nervous to pursue because of its dangerous nature. This work has helped me realize that taking personal financial, emotional, and lifestyle risks for the sake of ensuring equal opportunities in education for all people is worth taking. Q. What advice would you give to other students about being a research assistant? Maris: I think every graduate student should pursue a research assistantship if they can fit it into their schedule. 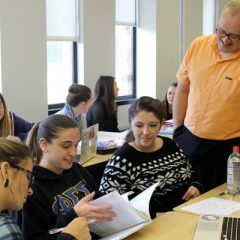 I think that if they can find an assistantship that is related or closely aligns with their academic interests, they will gain important familiarity, professional experience, and essential skills for their academic life. Laura (Nina): I advise all undergrad students to at least dip their toes into the research world. Even if you sign on to a project that is not directly related to your field, the experience prepares you for your graduate or post-graduate education and opens your eyes to current issues you may not have realized are astonishingly influential and complex. You also will gain an appreciation of how the smallest elements make a huge impact on how our world works. 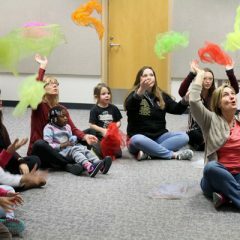 For information about our Education programs and faculty, visit www.umflint.edu/education. For research opportunities, contact the Undergraduate Research Opportunity Program or Graduate Programs.